Europe is one of our families favorite places to travel to, regardless of when we travel there. There is so much history, so much to see, learn and do as well as so much to eat. We’ve been to Europe as a family several, and visited several cities, so coming up with this list of our favorite European countries wasn’t the easiest thing to do. 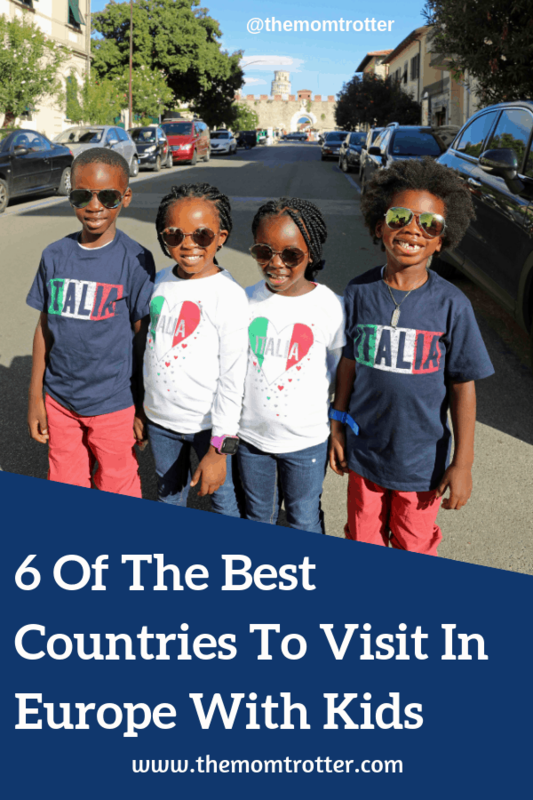 If you’re planning a trip to Europe soon, make sure to check out this list of 6 best countries to visit in Europe with kids. France is a magnificent country and it is famous for its beauty, architecture, art, fashion, and world-class cuisine. This country is among the top travel destination and the best part about the country is that it is family-friendly with many attractions and landmarks waiting for them. Disneyland Paris: this is one attraction that you should not miss while in France with kids with many great rides, play areas, parades, and shows, your kids will also get to see their favorite Disney characters. Eiffel Tower: This is one place that most children dream of visiting. Make sure to climb up to the top of the tower for amazing views of Paris. Have lunch at the restaurant also. Palace Of Versailles: this palace is so huge that you need a golf cart to explore it.If you have older kids, they will enjoy the history and younger kids will love the park area where they can run around and play. Nice: this is among the top family-friendly destination in France and it is filled with many attractions from the beach to Piazza Rossetti, to Park de la Colline du Chateau and many more. Parc Asterix: This is a theme park with numerous roller coasters rides and large adventure play area. Château de Béhen: this is a family home turned guesthouse with pint-sized Falabella horses which your kids will love. Goldstar Resort & Suites: this hotel is situated in Nice close to the beach and the boulevard with numerous eateries, rooftop terrace with sunbeds, swimming pool, cafes, and so on. Four Seasons Hotel George V: this is a family-friendly hotel with children’s menus in the restaurants, indoor pool, babysitting services, game consoles and more. Hôtel Barrière Le Fouquet’s: this is a luxurious hotel with an indoor pool with a lifeguard, kids’ menu in the restaurant, welcome gift for the children, and so on. Residence Alma Marceau: it is close to the Arc de Triomphe with complete kitchenettes which include washing machines, ovens, dishwashers, baby equipment, and amenities like car hire, dry cleaning service, babysitting service, and many more. Although expensive, Sweden is a fun and easy place to travel with kids of all ages from infants to teens. The country is filled with plenty of sights and activities which are designed specifically for kids with reduced admission to several attractions for kids under the age of 18. Liseberg Amusement Park: this attraction is filled with lots of rides and it also hosts large-scale events like concerts and so on which will thrill your young ones. Vasamuseet (Vasa Museum): This is a unique experience for your kid as they will get to explore the ruins of this warship and this attraction is the perfect place for Instagram worthy pictures. Medieval Week, Gotland: This is a one of its kind experience for your kids as they get to learn what life is all about in Medieval times while they get to try out medieval activities. This week happens during August. Kamelranch: This is a ranch where your kids will get hands-on experience with some farm animals and the ranch also features playground which your kids will love. Skansen: Your kids will love this miniature Sweden and open air museum in the summer and in the winter. The winter market here is amazing and there are several sections of the museum to explore. Radisson Blu Royal Viking Hotel: You will love as the hotel is located in a central location and it features a small swimming pool, sauna, hot tub, and on-site restaurant with children’s menu. Grand Central by Scandic: This hotel is family-friendly with welcome gifts for kids, daily free breakfast with organic and gluten-free options, free bicycle rentals, sauna, etc. Motel L: This is a mid-range motel with family rooms equipped with two bunk beds, colorful carpets, spacious restaurant with a bar area, and many more. Scandic Victoria Tower: Your children will be treated like royalty as they arrive at the hotel with lots of gifts bestowed upon them as you enter. The hotel also offers free breakfast daily. Hilton Stockholm Slussen: Your kids will love the wide array of breakfast foods as this hotel and you will love that kids eat free with the purchase of an adult meal at their in house restaurant. The United Kingdom is one great place to go with kids with a many historic landmarks, awesome accents and many free kid-friendly activities. Your kids will have a lot of things to do in this city from roller coaster rides to adventure trails, to stunning performances to a kid-friendly museums. Science Museum: This is a stunning place for kids where they will get to learn about the physical world and the people that helped to advance our understanding of the world. Legoland: theme park with lots of thrilling adventure, from interactive adventures to Lego-themed rollercoasters. Natural History Museum: this is a museum where your kids will get to see dinosaur fossils and eggs and other mesmerizing collections of dinosaurs. Zipworld: this is an out of this world underground environment with zip lines, climbing grips, and also the huge bouncy net. The things to do here are so fun that it will leave your kids exhausted. Tower of London: This is the perfect place to go if you want to learn about the history of London and England as a whole. You can explore this tower and then see the famous Traitors’ Gate. Stonehenge: The United Kingdom is well known for this historic monument and your kids will have lots of questions to ask about it. So, make sure to read about it before your trip or get a guide. The Swan Hotel & Spa: This hotel features extravagant rooms with a friendly and relaxed atmosphere. The hotel is filled with numerous kids’ friendly adventure playground with a nature trail with indoor playroom. Another Place: This is the best place for families and younger adults. The hotel features an indoor pool, spa treatments rooms, outdoor hot tub, water sports like paddle boarding, kayaking for older children, there is also an indoor play area, and so on. Cliveden, Berkshire: this is a magnificent hotel surrounded by ancient woodland and it has special children’s swimming hours with children’s menu at the restaurant. Four Seasons Hotel Hampshire: This is a superb hotel with a kids’ club, family swim times, two wooden climbing frames, and many more. Denmark is popular for its numerous palaces and castles with mesmerizing landscape and this is a perfect place to go if you love and want to learn about history. The country is also family-friendly with many outdoor attractions that you can try out. Your kids will have many intriguing things to spend their energy while going sightseeing in this country. Go sightseeing at Copenhagen zoo: this is among the oldest zoos in Europe and it is the best place to go with kids as you will see numerous animals. There is also a children zoo for young kids as they will get close up interaction with the animals like dwarf goats and so on. Visit the Maritime Museum: this is a unique underground museum and this is a perfect place to go with your kids as they will learn about the maritime history of Denmark. Have fun in Legoland: this is a theme park with lots of fun things waiting for your kids with its numerous rides and themed areas that they can explore. Visit the Little Mermaid statue: this will be a mesmerizing sight to your kids and you can also take Instagram worthy pictures here. Watch the wild horses of Langeland: this is a perfect chance for your kids to see flocks of horses as they run freely all over the island. Manon Les Suites: this is an eco-friendly hotel which features family suites with kitchenettes and refrigerators, and the hotel is equipped with kid-friendly amenities like swimming pool, bike rental, on-site restaurant and so on. Generator Hostel: budget-friendly hotel with quad rooms for family. The hotel is also equipped with a restaurant, bike hire, shuffleboard center, etc. Copenhagen Crown Hotel: This is another budget hotel with simple and clean family rooms and it is close to many restaurants, and possess facilities like bike rental, bar, and restaurant. Stay Seaport: this offers modern luxury with fully equipped kitchens, mesmerizing views of the harbor, washing machines, a rooftop terrace, lounge area, and many more and it is a close to the train station. Italy is a stunning country with a magical experience awaiting your kids in this city. Your kids will be treated like a prince and princess which will make a trip here delightful for them. There are many family-friendly attractions and iconic landmarks that you can explore in this country. Visit the Leaning Tower of Pisa: Your kids will marvel at this leaning tower and enjoy running around the grassy playground right in front of it. Eat gelato: this is one of the special treats that you can use to spoil your children during your trip to Italy which is available everywhere in Italy. Tour the canals of Venice: Your trip to Italy will not be complete without coming to Venice where you will get to see mesmerizing architecture and your kids will love guided canal boat tour where they will get to learn about the intriguing story of the waterways. Relax on the stunning Amalfi Coast: this is a magnificent resort town with stunning scenery and iconic ancient building that you can explore. Learn about the past in Pompeii: this is one of the adventurous and thrilling things to do in Italy as you will get to learn about the life of people in Pompeii. Castello di Gargonza: This hotel is perfect for kids of all ages with magnificent atmosphere with a large family villa. It also features pool, bread and pizza making lesson, and bikes for hire for kids. Masseria Ciancio: lovely hotel with spacious room and it has kid-friendly amenities like lovely pool, playground, flowering gardens and so on. Borgo Egnazia: a family resort with unique interior design and kid-friendly amenities like kid’s club, soothing spa, etc. Hotel Santa Maria: this is a family-friendly hotel in Rome located in a serene environment with large suites perfect for families. Residence Hilda: this is a tranquil oasis close to many shops and playground that your kids can spend their time. Spain is a perfect family destination with family-oriented attractions and activities which is going to keep you and your kids entertained. The country is also filled with many historic landmarks and magnificent culture with distinctive areas. La Sagrada Familia: this is in the heart of the city of Barcelona and will wow you and your kids. It is still being built, but looks beautiful. This church also gives you the chance to take family photos. Parc Guell: this is a garden complex with stunning views, magnificent exhibits, interpretive visitor center, and your kids will also learn the history of the park while they are here. Retiro Park: this Madrid park is perfect for a family stroll, or picnic. You can also go on an entertaining boat ride around the lake while also enjoying art exhibitions and live performances. City of Arts and Sciences in Valencia: Valencia has several famous futuristic buildings your kids will enjoy looking it. There is also an interactive science museum and an underwater world of Oceanografic the whole family will love. Bike riding here is also quite exciting. Nakar Hotel: the hotel is equipped with an outdoor pool with magnificent views of the city, onsite restaurant with kids’ menu. Palma Old Town – Turismo de Interior: the hotel is equipped with a family-friendly room with private bathroom, dining area, kitchen, and an outdoor pool. Hotel Bosch Boutique: Boutique hotel with a tour desk and the perfect place to try out Mediterranean dishes at the restaurant. Fil Suites – Turismo de Interior: this is a well-equipped accommodation close to the Palma port and yacht club.